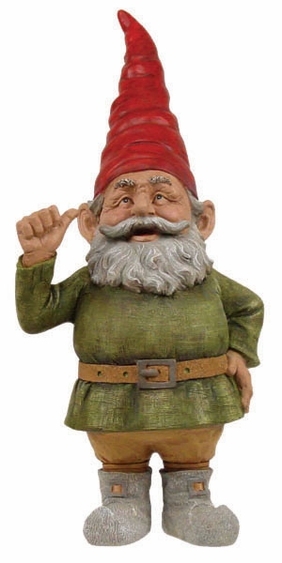 Our new 15" Rumple Lawn Gnome looks up at you as if to say "Good job, buddy!" He's got a cool stance that includes a big thumbs-up, presumably to give his approval for your superior gardening skills! Plop this garden gnome in your floral beds, on the front porch or out in the yard. No matter where he goes, he's got a charming and classic gnome look that's sure to brighten your days. We just can't get enough of his iconic red pointed hat and adorable gray beard! In addition to his stylish attire, our Rumple Lawn Gnome features a durable design. He's made from weather-resistant cast stone to ensure he holds up well over the years. He stands 15" tall, making him a cute little addition to your outdoor space.